"Abu Nasr" redirects here. For other uses, see Abu Nasr (disambiguation). In Islamic philosophical tradition, he is known with the honorific "the Second Teacher", after Aristotle being known in the East as "the First Teacher". He is credited with preserving the original Greek texts during the Middle Ages because of his commentaries and treatises, and influencing many prominent philosophers, like Avicenna and Maimonides. Through his works, he became well-known in the East as well as the West. The existing variations in the basic accounts of al-Farabi's origins and pedigree indicate that they were not recorded during his lifetime or soon thereafter by anyone with concrete information, but were based on hearsay or guesses (as is the case with other contemporaries of al-Farabi). Little is known about his life. Early sources include an autobiographical passage where al-Farabi traces the history of logic and philosophy up to his time, and brief mentions by Al-Masudi, Ibn al-Nadim and Ibn Hawqal. Said Al-Andalusi wrote a biography of al-Farabi. Arabic biographers of the 12th–13th centuries thus had few facts to hand, and used invented stories about his life. His birthplace could have been any one of the many places in Central Asia-Khurasan that is known by that name. The name "parab/farab" is a Persian term for a locale that is irrigated by effluent springs or flows from a nearby river. Thus, there are many places that carry the name (or various evolutions of that hydrological/geological toponym) in that general area, such as Fārāb on the Jaxartes (Syr Darya) in modern Kazakhstan, Fārāb (modern Türkmenabat) on the Oxus Amu Darya in Turkmenistan, or evenFāryāb in Greater Khorasan (modern day Afghanistan). The older Persian Pārāb (in Ḥudūd al-ʿĀlam) or Fāryāb (also Pāryāb), is a common Persian toponym meaning "lands irrigated by diversion of river water". By the 13th century, Fārāb on the Jaxartes was known as Otrār. Scholars largely agree that Farabi's ethnic background is not knowable. 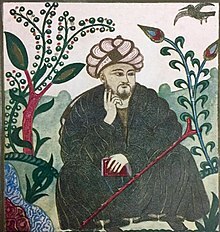 Medieval Arab historian Ibn Abī Uṣaibiʿa (died in 1270)—al-Farabi's oldest biographer—mentions in his ʿUyūn that al-Farabi's father was of Persian descent. Al-Shahrazūrī who lived around 1288 A.D. and has written an early biography also states that Farabi hailed from a Persian family. According to Majid Fakhry, an Emeritus Professor of Philosophy at Georgetown University, Farabi's father "was an army captain of Persian extraction." Dimitri Gutas notes that Farabi's works contain references and glosses in Persian, Sogdian, and even Greek, but not Turkish. Sogdian has also been suggested as his native language and the language of the inhabitants of Fārāb. Muhammad Javad Mashkoor argues for an Iranian-speaking Central Asian origin. A Persian origin has been discussed by other sources as well. Al-Farabi spent almost his entire life in Baghdad. In the auto-biographical passage preserved by Ibn Abī Uṣaibiʿa, Farabi stated that he had studied logic, medicine and sociology with Yūḥannā bin Ḥaylān up to and including Aristotle's Posterior Analytics, i.e., according to the order of the books studied in the curriculum, Fārābī was claiming that he had studied Porphyry's Eisagoge and Aristotle's Categories, De Interpretatione, Prior and Posterior Analytics. His teacher, bin Ḥaylān, was a Nestorian cleric. This period of study was probably in Baghdad, where Al-Masudi records that Yūḥannā died during the reign of Al-Muqtadir (295-320/908-32). He was in Baghdad at least until the end of September 942, as recorded in notes in his Mabādeʾ ārāʾ ahl al-madīna al-fāżela. He finished the book in Damascus the following year (331), i.e., by September 943). He also studied in Tétouan, Morocco and lived and taught for some time in Aleppo. Farabi later visited Egypt, finishing six sections summarizing the book Mabādeʾ in Egypt in 337/July 948 – June 949 when he returned to Syria, where he was supported by Sayf al-Dawla, the Hamdanid ruler. Al-Masudi, writing barely five years after the fact (955-6, the date of the composition of the Tanbīh), says that Farabi died in Damascus in Rajab 339 (between 14 December 950 and 12 January 951). Al-Farabi also wrote a commentary on Aristotle's work, and one of his most notable works is Al-Madina al-Fadila (اراء اهل المدينة الفاضلة و مضاداتها) where he theorized an ideal state as in Plato's The Republic. Al-Farabi argued that religion rendered truth through symbols and persuasion, and, like Plato, saw it as the duty of the philosopher to provide guidance to the state. Al-Farabi incorporated the Platonic view, drawing a parallel from within the Islamic context, in that he regarded the ideal state to be ruled by the prophet-imam, instead of the philosopher-king envisaged by Plato. Al-Farabi argued that the ideal state was the city-state of Medina when it was governed by the prophet Muhammad as its head of state, as he was in direct communion with Allah whose law was revealed to him. According to Adamson, his work was singularly directed towards the goal of simultaneously reviving and reinventing the Alexandrian philosophical tradition, to which his Christian teacher, Yuhanna bin Haylan belonged. His success should be measured by the honorific title of "the second master" of philosophy (Aristotle being the first), by which he was known. Adamson also says that he does not make any reference to the ideas of either al-Kindi or his contemporary, Abu Bakr al-Razi, which clearly indicates that he did not consider their approach to Philosophy as a correct or viable one. Whether or not al-Farabi actually intended to outline a political programme in his writings remains a matter of dispute amongst academics. Henry Corbin, who considers al-Farabi to be a crypto-Shi'ite, says that his ideas should be understood as a "prophetic philosophy" instead of being interpreted politically. On the other hand, Charles Butterworth contends that nowhere in his work does al-Farabi speak of a prophet-legislator or revelation (even the word philosophy is scarcely mentioned), and the main discussion that takes place concerns the positions of "king" and "statesmen". Occupying a middle position is David Reisman, who like Corbin believes that al-Farabi did not want to expound a political doctrine (although he does not go so far to attribute it to Islamic Gnosticism either). He argues that al-Farabi was using different types of society as examples, in the context of an ethical discussion, to show what effect correct or incorrect thinking could have. Lastly, Joshua Parens argues that al-Farabi was slyly asserting that a pan-Islamic society could not be made, by using reason to show how many conditions (such as moral and deliberative virtue) would have to be met, thus leading the reader to conclude that humans are not fit for such a society. Some other authors like Mykhaylo Yakubovych argue that for al-Farabi religion (milla) and philosophy (falsafa) constituted the same praxeological value (i.e. basis for amal al-fadhil—"virtuous deed"), while its epistemological level (ilm—"knowledge") was different. The main-belt asteroid 7057 Al-Fārābī was named in his honor. ^ a b c d e f g h i j k l m Gutas, Dimitri. "Farabi". Encyclopædia Iranica. Retrieved April 4, 2010. ^ Brague, Rémi; Brague, Remi (1998). "Athens, Jerusalem, Mecca: Leo Strauss's "Muslim" Understanding of Greek Philosophy". Poetics Today. 19 (2): 235–259. doi:10.2307/1773441. ISSN 0333-5372. JSTOR 1773441. ^ Alternative names and translations from Arabic include: Alfarabi, Farabi, Avenassar, and Abunaser. ^ Ludwig W. Adamec (2009), Historical Dictionary of Islam, pp.95–96. Scarecrow Press. ISBN 0810861615. ^ a b López-Farjeat, Luis Xavier. "Al-Farabi's Psychology and Epistemology". In Zalta, Edward N. (ed.). Stanford Encyclopedia of Philosophy. ^ DANIEL BALLAND, "FĀRYĀB" in Encyclopedia Iranica [permanent dead link]. excerpt: "Fāryāb (also Pāryāb), common Persian toponym meaning “lands irrigated by diversion of river water"
^ "C. E. Bosworth, "OTRĀR" in Encyclopedia Iranica". Iranicaonline.org. 2002-07-20. Retrieved 2012-09-19. ^ "al-Farabi – Muslim philosopher". ^ Lessons with Texts by Alfarabi. "D. Gutas, "AlFarabi" in Barthaolomew's World accessed Feb 18, 2010". Bartholomew.stanford.edu. Retrieved 2012-09-19. ^ David C. Reisman, "Al-Farabi and the philosophical curriculum", in Peter Adamson and Richard C. Taylor, The Cambridge companion to Arabic philosophy, Cambridge University Press, 2005, p. 53. ^ Seyyed Hossein Nasr, Mehdi Amin Razavi. "An Anthology of Philosophy in Persia, Vol. 1: From Zoroaster to Umar Khayyam", I.B. Tauris in association with The Institute of Ismaili Studies, 2007. Pg 134: "Ibn Nadim in his al-Fihrist, which is the first work to mention Farabi considers him to be of Persian origin, as does Muhammad Shahrazuri in his Tarikh al-hukama and Ibn Abi Usaybi'ah in his Tabaqat al-atibba. In contrast, Ibn Khallikan in his '"Wafayat al-'ayan considers him to be of Turkish descent. In any case, he was born in Farab in Khurasan of that day around 257/870 in a climate of Persianate culture"
^ Arabic: و كان من سلاله فارس in J. Mashkur, Farab and Farabi, Tehran,1972. See also Dehkhoda Dictionary under the entry Farabi for the same exact Arabic quote. ^ Majid Fakhry, Al-Farabi, Founder of Islamic Neoplatonism: His Life, Works and Influence, Great Islamic Thinkers (Oxford: Oneworld Publications, 2002), 157. ISBN 9781851683024. George Fadlo Hourani, Essays on Islamic Philosophy and Science, Suny press, 1975. ^ Joep Lameer, "Al-Fārābī and Aristotelian syllogistics: Greek theory and Islamic practice", E.J. Brill, 1994. ISBN 90-04-09884-4 pg 22: "..Islamic world of that time, an area whose inhabitants must have spoken Soghdian or maybe a Turkish dialect..."
^ مشكور، محمدجواد. “فاراب و فارابي“. دوره14، ش161 (اسفند 54): 15-20- . J. Mashkur, "Farabi and Farabi" in volume 14, No. 161, pp 15–12, Tehran,1972. English translations of the arguments used by J. Mashkur can be found in: G. Lohraspi, "Some remarks on Farabi's background"; a scholarly approach citing C.E. Bosworth, B. Lewis, R. Frye, D. Gutas, J. Mashkur and partial translation of J.Mashkur's arguments: PDF. ولي فارابي فيلسوف تنها متعلق به ايران نبود بلكه به عالم اسلام تعلق داشت و از بركت قرآن و دين محمد به اين مقام رسيد. از اينجهت هه دانشمنداني كه در اينجا گرد آمده‌اند او را يك دانشمند مسلمان متعلق به عالم انسانيت مي‌دانند و كاري به تركي و فارسي و عربي بودن او ندارند. P.J. King, "One Hundred Philosophers: the life and work of the world's greatest thinkers", chapter al-Fārābi, Zebra, 2006. pp 50: "Of Persian stock, al-Farabi (Alfarabius, AbuNaser) was born in Turkestan"
edited by Robert C. Solomon and Kathleen M. Higgins. (2003). From Africa to Zen : an invitation to world philosophy. Lanham, Md. : Rowman & Littlefield Publishers. pp. 163. ISBN 0-7425-1350-5 "al-Farabi (870–950), a Persian,"
Thomas F. Glick. (1995). From Muslim fortress to Christian castle : social and cultural change in medieval Spain. Manchester: Manchester University Press. pp. 170. ISBN 0-7190-3349-7 "It was thus that al-Farabi (c. 870–950), a Persian philosopher"
Olivier Roy, "The new Central Asia: the creation of nations ", I.B.Tauris, 2000. 1860642799. pg 167: "Kazakhistan also annexes for the purpose of bank notes Al Farabi (870–950), the Muslim philosopher who was born in the south of present-day Kazakhistan but who persumably spoke Persian, particularly because in that era there were no Kazakhs in the region"
^ B.G. Gafurov, Central Asia:Pre-Historic to Pre-Modern Times, (Shipra Publications, 2005), 124; "Abu Nasr Farabi hailed from around ancient Farabi which was situated on the bank of Syr Daria and was the son of a Turk military commander". ^ Will Durant, The Age of Faith, (Simon and Schuster, 1950), 253. ^ Nicholas Rescher, Al-Farabi's Short Commentary on Aristotle's Prior Analytics, University of Pittsburgh Pre, 1963, p.11, Online Edition. ^ * edited by Ted Honderich. (1995). The Oxford companion to philosophy. Oxford: Oxford University Press. pp. 269. ISBN 0-19-866132-0 "Of Turki origin, al-Farabi studied under Christian thinkers"
edited by Henrietta Moore. (1996). The future of anthropological knowledge. London: Routledge. ISBN 0-415-10786-5 "al-Farabi (873–950), a scholar of Turkish origin." ^ Clifford Edmund Bosworth, "Barbarian Incursions: The Coming of the Turks into the Islamic World." In Islamic Civilization, ed. by D.S. Richards. Oxford, 1973. ^ Sadler, Anthony; Skarlatos, Alek; Stone, Spencer; Stern, Jeffrey E. (2016). The 15:17 to Paris: The True Story of a Terrorist, a Train, and Three American Heroes. New York: PublicAffairs. p. 18. ISBN 978-1-61039-734-6. ^ Corbin, Henry (23 June 2014). "History Of Islamic Philosophy". Routledge – via Google Books. ^ Maftouni, Nadia (2013). "وجوه شیعی فلسفه فارابی" [Shi'ite Aspects of Farabi`s Philosophy]. Andishe-Novin-E-Dini (in Persian). 9 (33): 12. Retrieved 31 October 2018. ^ Houtsma, M. Th (1993). "E. J. Brill's First Encyclopaedia of Islam, 1913–1936". ISBN 9789004097902. ^ Feldman, Seymour (26 November 1964). "Rescher on Arabic Logic". The Journal of Philosophy. Journal of Philosophy, Inc. 61 (22): 726. ISSN 0022-362X. JSTOR 2023632. Long, A. A.; D. N. Sedley (1987). The Hellenistic Philosophers. Vol 1: Translations of the principal sources with philosophical commentary. Cambridge: Cambridge University Press. ISBN 0-521-27556-3. ^ Ludescher, Tanyss (February 1996). "The Islamic roots of the poetic syllogism". College Literature. Archived from the original on 2005-05-31. Retrieved 2008-02-29. ^ a b c Amber Haque (2004), "Psychology from Islamic Perspective: Contributions of Early Muslim Scholars and Challenges to Contemporary Muslim Psychologists", Journal of Religion and Health 43 (4): 357–377 . ^ Netton, Ian Richard (2008). "Breaking with Athens: Alfarabi as Founder, Applications of Political Theory By Christopher A. Colmo". Journal of Islamic Studies. Oxford University Press. 19 (3): 397–8. doi:10.1093/jis/etn047. ^ Glick, Thomas F., Steven Livesey and Faith Wallis (2014). Medieval Science, Technology, and Medicine: An Encyclopedia. New York: Routledge. p. 171. ISBN 0415969301. ^ "Avicenna/Ibn Sina (CA. 980–1137)". The Internet Encyclopedia of Philosophy. Archived from the original on 23 June 2007. Retrieved 2007-07-13. ^ Black, D. Al-Farabi in Leaman, O & Nasr, H (2001). History of Islamic Philosophy. London: Routledge. p178. ^ Motahhari, Morteza, Becoming familiar with Islamic knowledge, V1, p.166 اگر بخواهيم كلمهای را به كار بريم كه مفيد مفهوم روش فلسفی مشائين باشد بايد كلمه ( استدلالی ) را به كار بريم . ^ "Dictionary of Islamic Philosophical Terms". Muslimphilosophy.com. Retrieved 2012-09-19. ^ "Aristotelianism in Islamic philosophy". Muslimphilosophy.com. Retrieved 2012-09-19. ^ Motahhari, Mortaza, Becoming familiar with Islamic knowledge, V1, p.167 فارابی كتاب كوچك معروفی دارد به نام ( الجمع بين رأيی الحكيمين ) در اين كتاب مسائل اختلافی اين دو فيلسوف طرح شده و كوشش شده كه به نحوی اختلافات ميان اين دو حكيم از بين برود . ^ Mahdi, Muhsin (1962). Alfarabi: Philosophy of Plato and Aristotle. Ithaca, NY: Cornell University Press. p. 4. ISBN 0801487161. Retrieved 17 August 2015. ^ "page 461" (PDF). Archived from the original (PDF) on 2007-03-25. ^ Joshua Parens, An Islamic Philosophy of Virtuous Religions: Introducing Alfarabi (New York: State University of New York Press, 2006), 2. ^ Mykhaylo Yakubovych. Al-Farabi's Book of Religion. Ukrainian translation, introduction and comments / Ukrainian Religious Studies Bulletin, 2008, Vol. 47, P. 237. ^ "7057 Al-Farabi (1990 QL2)". Minor Planet Center. Retrieved 21 November 2016. Al-Farabi's Commentary and Short Treatise on Aristotle's De interpretatione, Oxford: Oxford University Press, 1981. Short Commentary on Aristotle's Prior Analytics, Pittsburgh: University of Pittsburgh Press, 1963. Al-Farabi on the Perfect State, Oxford: Clarendon Press, 1985. Alfarabi, the Political Writings. Selected Aphorisms and Other Texts, Ithaca: Cornell University Press, 2001. Alfarabi's Philosophy of Plato and Aristotle, translated and with an introduction by Muhsin Mahdi, Ithaca: Cornell University Press, 2001. Fusul al-Madani: Aphorisms of the Statesman Cambridge: Cambridge University Press, 1961. "Al-Farabi's Long Commentary on Aristotle's Categoriae in Hebrew and Arabic", In Studies in Arabic and Islamic Culture, Vol. II, edited by Abrahamov, Binyamin. Ramat: Bar-Ilan University Press, 2006. "The Existence and Definition of Philosophy. From an Arabic text ascribed to al-Farabi", Iraq, 1951, pp. 76–93). "Al-Farabi's Aphorisms of the Statesman", Iraq, 1952, pp. 93–117. "Al-Farabi's Introductory Sections on Logic", The Islamic Quarterly, 1955, pp. 264–282. "Al-Farabi's Eisagoge", The Islamic Quarterly, 1956, pp. 117–138. "Al-Farabi's Introductory Risalah on Logic", The Islamic Quarterly, 1956, pp. 224–235. "Al-Farabi's Paraphrase of the Categories of Aristotle [Part 1]", The Islamic Quarterly, 1957, pp. 168–197. "Al-Farabi's Paraphrase of the Categories of Aristotle [Part 2]", The Islamic Quarterly, 1959, pp. 21–54. Le Livre du régime politique, introduction, traduction et commentaire de Philippe Vallat, Paris: Les Belles Lettres, 2012. Catálogo De Las Ciencias, Madrid: Imp. de Estanislao Maestre, 1932. "Al-Farabi: Epístola sobre los sentidos del término intelecto", Revista Española de filosofía medieval, 2002, pp. 215–223. Obras filosóficas y políticas, trad. R. Ramón Guerrero, Madrid: Ed. Trotta, 2008. Las filosofías de Platón y Aristóteles. Con un Apéndice: Sumario de las Leyes de Platón. Prólogo y Tratado primero, traducción, introducción y notas de Rafael Ramón Guerrero, Madrid, Ápeiron Ediciones, 2017. Deborah Black (2001). Al-Farabi in Oliver Leaman and Hossein Nasr. History of Islamic Philosophy. London: Routledge. Deborah Black (2005). Psychology: Soul and Intellect in P. Adamson and R. Taylor (2005). The Cambridge Companion to Arabic Philosophy,[page needed]. Cambridge: Cambridge University Press. Charles Butterworth (2005). "Ethical and Political Philosophy". In P. Adamson and R. Taylor, The Cambridge Companion to Arabic Philosophy,[page needed]. Cambridge: Cambridge University Press. Henry Corbin; Hossein Nasr; Utman Yahya (1993). History of Islamic Philosophy. Keagan Paul International. ISBN 978-0-7103-0416-2. Majid Fakhry (2002). Al-Farabi, Founder of Islamic Neoplatonism: His Life, Works, and Influence, Oxford: Oneworld Publications. ISBN 1-85168-302-X. Spanish translation, as: Alfarabi y la fundación de la filosofía política islámica, translated by R. Ramón Guerrero. Barcelona: Herder, 2003. Miriam Galston (2003). Politics and Excellence: the Political Philosophy of Alfarabi. Princeton: Princeton University Press. Rafael Ramón Guerrero (2003). “Apuntes biográficos de al-Fârâbî según sus vidas árabes". In Anaquel de Estudios Árabes 14:231–238. Christoph Marcinkowski (2002). "A Biographical Note on Ibn Bajjah (Avempace) and an English Translation of his Annotations to Al-Farabi's Isagoge". Iqbal Review vol. 43, no 2 (April), pp 83–99. Monteil Jean-François (2004). “La transmission d’Aristote par les Arabes à la chrétienté occidentale: une trouvaille relative au De Interpretatione”. Revista Española de Filosofia Medieval 11: 181–195. Nicholas Rescher (1964). Al-Kindí; An Annotated Bibliography. Pittsburgh: University of Pittsburgh Press. David Reisman (2005). Al-Farabi and the Philosophical Curriculum In P. Adamson and & R. Taylor. The Cambridge Companion to Arabic Philosophy,[page needed]. Cambridge: Cambridge University Press. Wikimedia Commons has media related to Al-Farabi. Therese-Anne Druart. "Al-Farabi". In Zalta, Edward N. (ed.). Stanford Encyclopedia of Philosophy. Wilfrid Hodges & Therese-Anne Druart. "Al-Farabi's Philosophy of Logic and Language". In Zalta, Edward N. (ed.). Stanford Encyclopedia of Philosophy. Luis Xavier López-Farjeat. "Al-Farabi's Psychology and Epistemology". In Zalta, Edward N. (ed.). Stanford Encyclopedia of Philosophy. Nadja Germann. "Al-Farabi's Philosophy of Society and Religion". In Zalta, Edward N. (ed.). Stanford Encyclopedia of Philosophy. Mahdi, Muhsin (2008) [1970–80]. "Al-Fārābī, Abū Naṣr Muḥammad Ibn Muḥammad Ibn Ṭarkhān Ibn Awzalagh]". Complete Dictionary of Scientific Biography. Encyclopedia.com.